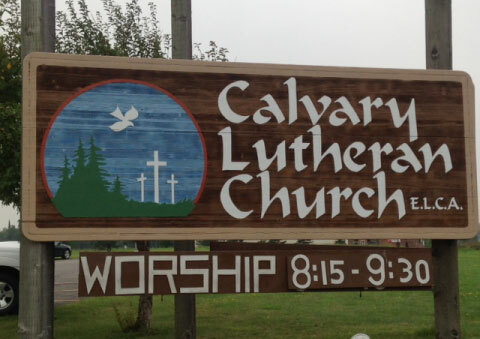 Calvary’s story goes back to 1905, when a Norwegian-American family on the south side of Lake Bemidji began holding Sunday School classes and worship services. In 1908, the congregation was legally incorporated as Nymore Lutheran Free Church, and a new church building was completed. In 1926, a big change happened: the language for the worship services was switched from Norwegian to English! Through the years, other changes occurred. In the ‘60s, the congregation become part of the American Lutheran Church (ALC), changed its name to Calvary Lutheran Church, and moved into a newer and bigger building. New ministries and partnerships started. The congregation supported refugee families and formed a sister parish relationship with a community in Guatemala. In the ‘80s, Calvary started a preschool and become host to an adult day service program. We also moved into a new building at our current location on Highway 71 and in 1988 became part of the newly formed Evangelical Lutheran Church in America (ELCA). In 2007, the congregation began remodeling and adding on to our building. The new gym, youth room, and classrooms allow us to host the homeless shelter, foster our expanding youth ministries, and sustain a preschool of over 80 children. In 2014, Calvary adopted our new and current vision statement: “Jesus calls us to grow as disciples, to give generously, and to serve others every day.” Our capital campaign, “The Bridge,” started in early 2015, and is enabling us to reduce our building, mortgage and make facility improvements. Today, we are an energetic and gospel-centered Lutheran Christian congregation, with over 500 people worshipping together with us weekly. We’re grateful for the past, fully engaged in the present, and hopeful about the future that God has for us. Across the sandbar which traversed the east and west banks of the Mississippi River, another community soon developed. Porter Nye homesteaded an area near what is now Highway No 71 and south of Fifth Street. This farmstead was later platted and the village of Nymore named for the early homesteaders Nye and Moore was incorporated in 1903. When the Crookston Lumber Company opened a large sawmill on the shores of Lake Bemidji in April, 1904, the village experienced a dramatic growth. Among the early settlers was the Mathew Larson family. This devout Norwegian family opened a store on the corner of present Central Avenue and South 4th Street. Early in 1905 they began conducting Sunday School classes for the Norwegian children of the area. Later on, services were conducted in the home by visiting pastors and students from Augsburg College. On December 5, 1907 the Nymore Norwegian Lutheran Church was formally organized. Pastor Carl Amundsen was called as the first pastor of the small congregation. That the Larsons were a visionary people is well documented. As early as 1904, they had donated land for a cemetery to the Norwegian Lutheran Church. Some of Mrs. Larson’s relatives are among the earliest burials in the cemetery which yet serves the congregation and the community. The congregation was incorporated under the laws of the State of Minnesota on July 27, 1908. This is the date that is being remembered in the Celebration of 1983. The following pages and pictures illustrate and dramatize the dream and courage of those early settlers. The early pioneers are symbolized by the name Bemidji- “a lake with cross waters,” for the congregation was comprised of people from many divergent strains. There were the lumbermen and railroad men along with the businessmen who incorporated the community and the church. They represented from an early time a variety of ethnic backgrounds for some of the earliest confirmation classes were conducted in Norwegian, Swedish and English. The cross of Jesus Christ was the unifying symbol. Today, the congregation has become an increasingly divergent group. Long passed is the strong ethnic identity. The first church that was erected on largely a volunteer basis in 1908-1909 has been replaced, first in 1963-4 and then with increased growth, with the lovely sanctuary on Highway No 71. Each building was erected with a great use of volunteer assistance. While there yet remain the Scandinavian names, a much larger representation of names from other backgrounds is in evidence. Having met at Concordia College in Moorhead, Luther Abrahamson and Marilyn Bjorkman were married December 28, 1961 and taught school in Alaska before entering Luther Theological Seminary in Minneapolis. Liv and Kara were born during those seminary years. Since there was a great need for pastors in Canada, they accepted a call near Calgary, Alberta. Luther drove 80 miles each Sunday as he served three congregations. Siri, born in Canada, was only 9 months old as they took the ferry from Seattle all the way to their parish in Seward, Alaska. They remember vividly sailing into Seward on a clear day, marveling at the beauty of the mountains, and fighting tears at seeing the congregation standing at the dock, waving and cheering to their new pastor and family. Their home was nestled at the bottom of beautiful Mt Marathon. Luther ad to be a “worker-priest”, teaching school (Marilyn substituted) and establishing a chaplaincy at a largely native training school. It was here he was asked to begin his military chaplaincy. The weeks of seacoast fog prompted the use of “Heavenly Sunshine” to begin the worship service. Can you imagine the beauty of witnessing a baptism in a sparkling mountain lake? Or keeping track of 35 church day school kids climbing a mountain? Or having Easter sunrise services on the ferry out on Resurrection Bay? 1905 A small group of devout Christians met at the home of Mathew and Marie Larson in Nymore. Worship services, Sunday School and Ladies Aid meetings were held in their home. The Norwegian language was spoken. 1907 Out of this group the Nymore Lutheran Free Church was organized. Church services were held in the Congregational Church due to the increase of membership. –Rev. Carl Amundsen was the first Pastor, 1907-1912. 1908 Nymore Lutheran Free Church was incorporated. The church building was completed in 1908 on property donated by Mathew Larson a Wood Avenue and 4th Street. 1909 The young women of the church organized in a group called the “Willing Workers”. The land for the Nymore Lutheran Cemetery was donated at this time by Mathew Larson. Julius Larson, father of Mrs. Carl Amundsen, was the first person buried in Nymore Cemetery. The second person buried here was John Melhus. The first child baptized in the new church was Earl Akre. Son of the Ed Akres. The first confirmation was held on September 26, 1909 with five members being confirmed. 1913 Rev. George Larson-Pastor from 1913-1916. Parsonage was built at 412 Wood Avenue. New organ, baptismal font, pulpit and chair were purchased. 1914 Large Norwegian family Bible published in 1890 by A. J. Holman Co. was presented to Nymore Lutheran Free Church by Mr. and Mrs. A. O. Akre in memory of the daughter, Hazel Margrite, who died February 19, 1914. 1915 Men’s Aid was formed. The Young People’s Society was formed, later called the Luther League. Their first project was the purchasing of the beautiful, colored window for the east side of the church. 1916 Rev. O. P. Grambo- 1916-1922. The east addition to the church completed. Teaching in English in one class of the church was started. 1921 West addition with basement was added to the church for a meeting room for the Men’s Club and extra Sunday School rooms; Carl Aldahl was contractor. 1922 Rev J. Martenson (interim) and Rev. H. E. Bode (interim). 1926 The services were changed from Norwegian to English. A parsonage was purchased at 701 South 4th Street as fire destroyed the one on Wood Avenue. 1935 Fire destroyed the parsonage on 4th St. and it was rebuilt in the same location and used until 1973. 1941 The Boy Scouts Troop No. 155 was sponsored by the Men’s Club. 1943 Rev. C. M. Iverson, 1943-1954. February 2, 1951 Ladies Aid joins Bemidji Council of Church Women. April 1953 Priscilla Society organized. 1954 Rev. Chris Iverson resigned. February 7, 1955 Reorganization of Ladies Aid with Esther and Dorcas Circles added. 1955 Men’s Aid changed to Men’s Club and joined the Lutheran Brotherhood as Local 1386. October 15, 1957 Purchased land on 4th St. and Grant Ave. for new church. April 1959 Couple’s Club organized. 1959 First Mother-Daughter Banquet held. 1960 Rev. Eugene Anderson installed. July 1963 Library started and sponsored by Couple’s Club. 1964 A large Bible was presented to Calvary Lutheran Church by the Buland Bros. who built “old” Calvary Church. 1964 Changed name to Calvary Lutheran Church. April 26, 1964 Dedication of new church building. July 7, 1964 Sold old church building to Nymore Revival Center. 1965 Membership in Minne-Wa-Kan Bible Camp. 1966 Bethel Bible Series program used. 1969 New Constitution, organization of present boards. September 1969 Stewardship program “Congregational Christian Concern”. Communion age changed to 6th grade. Senior and Junior Luther League combined. Sunday Class for mentally handicapped started. First Men’s Prayer Breakfast, Tuesday mornings. 1974 Rev. Selmer Hilde, interim pastor. Fall 1974 God Squad organized. Bell Rededication- bell was purchased at this time from the old church in memory of Mrs. Martin Johnson. Truong Family arrived. The first Southeast Asian refugee family relocated in Bemidji. Calvary sponsored the family. First Calvary Women’s Retreat at Minne-Wa-Kan Bible Camp. 1976 Dora Olson chosen Calvary’s “Valiant Woman”. 1977 Presentation of plaque to Mr. and Mrs. Carl Akre for their years of service. October 1979 Shepherding Groups organized. April 1980 Laotian Family (Saicocie) arrived. June 1980 Pastor and Marilyn Abrahamson hosted a Lutheran Heritage Tour to Germany which included the Passion Play at Oberammergau. Many from the community went on the tour, including Olivia Largis, Diane Seeley, and Kathy Vanderhoof from Calvary. 1981 Pastor and Marilyn Abrahamson, Liv, Kara, and Siri, hosted a tour to the Holy Land. Olivia Largis, Ellis Olson, Dorothy Johnson and Thelma Laager from our congregation were a part of the group. 1982 Palm Sunday services at three churches: services conducted by Pastor Selmer Hilde at the Wood Ave. Church, by Chaplain Curt Hanson at 5th and Grant Church, and by Pastor Luther Abrahamson at the new Calvary Church. Calvary Lutheran Church Women hosted a Fellowship Brunch and tour of new church for women of our sister congregation First Lutheran. Organ Dedication Recital by Dr Mary Helen Schmidt of Augustana College. Dedication Sunday. Church building at 1015 South 4th St. sold. Installation of Pastor Keith Zeh as Associate pastor. 1986 Calvary Christian Preschool opened. Musical groups from the congregation were formed, including Spirit Borne. 1987 Adult Day Services began programming at the church. 1990 Many outreach ministries were active (Sister Parish & Clown Ministry) More musical groups were formed including Maranatha & Barocha. 1998 A Boston grand piano was purchased. 2000 Wednesday Calvary Alive ! started. 2001 A Rodgers Trillium organ was purchased. 2002 Youth Mission trips began. Adult Day Services built a new building and expanded their services on land the church gifted to them. 2007 Remodeling and new addition to the current building began. A Ladies Aid was started in 1906 at the Mathew Larson home. A group of ladies from Bemidji often attended the meetings. The Aid met every two weeks. Its aim was to study God’s Word, to reach as many women as possible with the Word of God, and to work toward the beginning of a congregation. Everybody was willing to do their part and soon a church was built. The Aid helped pay the pastor’s salary, give to home and foreign missions, and later to Augsburg Seminary. The first project was to purchase a pulpit and chair, an organ, and baptismal font. The Aid had sponsored the parsonage and its upkeep. The first one was built at 412 Wood Avenue. Rev. George Larson was pastor at the time. It was built by Aardahl, Trinity and Nymore congregations. The Aid paid their share of the amount. While Pastor Grambo was pastor, the parsonage was destroyed by fire. In 1930 a house was purchased. In March 1930, The Aid was divided into two groups. Some years later these groups were changed to an evening circle, a Priscilla Society and a Missionary Society. They worked very hard to pay for the parsonage. 1960 was a year of growth for Nymore Lutheran Church. It was necessary to hold two worship services to accommodate our members and we developed into a one point parish. In 1961 growth continued and the congregation decided to investigate building a more adequate facility. This decision was reinforced with a successful building fund canvass of our members. Members elected to the first building committee were: Wayland Jones, Chairman, Al Sletten, treasurer, Warner Berglund, Donald Norum and Lester Peterson. Other members appointed to the committee later were: Mrs. C. A. Glassman, Mrs. Hilden Tell, Dallas Largis, Raymond Manecke, Pastor Eugene Anderson and Wallace Wubbels. During 1962 the Building Committee met regularly and a plan for a new church was developed. 1963 saw the contract for the new church awarded to the National Buildings Company of Fargo, ND. Groundbreaking ceremonies were held August 9, 1963 and the cornerstone was laid on November 24, 1963. Construction continued during the winter months and was completed in the spring of 1964. The cost of construction and furnishings was $102,300.00 with financing arranged through the Bemidji Savings and Loan Company. The first service was held on Sunday, March 8, 1964 and Dedication Sunday was April 26, 1964 with Bishop T.C. Hanson delivering the dedication message. From its inception in 1907 as the Nymore Lutheran Free Church to the present as Calvary Lutheran Church the Lord has indeed been good. He has given to many the command to “Feed my sheep” and over the years Christians have heeded this command. The church which began its meetings in the home of its members began to grow so that each facility was soon inadequate. Thus was the plan for a larger and newer church home beginning to take shape. As one member stated recently, “We began to take account of the number of children and young people into their future and provide a more adequate place for them. “So it was then, on April 26, 1964, that the Service of Dedication for the new Calvary Lutheran Church was held. Pastor Eugene Anderson was pastor at this time. To those of you who have grown up in this congregation there is an awareness of many changes in the past ten years, and also of many forward strides. Pastor Russell Anderson accepted our call to Calvary in 1965 serving until December 31, 1973. His untiring efforts of bringing the Gospel to the congregation and encouragement to us in the stewardship of our time and abilities never ceased, and we praise God for him and his family in our midst. One of the greatest forward strides Calvary has taken in the last ten years was the decision in 1966 to introduce the Bethel Series Bible Study Program. Well over one hundred adults enrolled in these classes over a period of six years with classes taught by George Peterson, Don Norum and Wallace Wubbels. To all who studied this Bible series the Word of God became alive and much more meaningful. In 1969 a new constitution was adopted setting up a new Council-Board structure. This has proved to be an effective form of leading as each particular need of the congregation can be studied by individual boards. The revision carried through into each of the organizations of the church, each one striving to evaluate how it could better serve the needs of the church as the Body of Christ. Another giant stride was the one taken when it was voted in 1972 to sell the old parsonage and purchase the home of Mr. and Mrs. David Pederson at 718 Kay Avenue for the new parsonage. Dedicatory services were held May 21, 1972, conducted by Rev. Steve Knudsen, with an open house following. The 65th Anniversary of the congregation was celebrated Sunday, October 8, 1972. Greetings were brought by former pastors Conrad Jergenson and Chris Iverson. Many greeting from other pastors were read at the service. After Pastor Russell Anderson announced his acceptance to a call to Dawson, MN a call committee was chosen to consider candidates for a new pastor. After hearing four candidates the congregation voted on March 10, 1974 to call Rev. Luther Abrahamson of Seward, Alaska. He has accepted our call and is to begin his duties as pastor of Calvary Lutheran in mid-June. We look forward with anticipation to his coming here with his wife and children. Although there has been no spectacular growth in membership, there has been an increase in church attendance and a substantial gain in financial giving over the years. The activities of the congregation through its various organizations continue to function to the glory of God. One need only to see the happy smiles of our Jesus Youth Alive group and see their exuberance for Christ, to know that our youth of today are to be the strong leaders of tomorrow that we look to. Many things could be mentioned here that have in the last ten years been a blessing to our congregation and to individual members, but God alone knows all the prayers offered, joys and sorrows shared, kind deeds done and hours spent in His Kingdom work. So it is with thankful hearts that we acknowledge the blessing of God during these past years knowing that we are HIS people, the sheep of HIS pasture and that HIS faithfulness goes on and on to each succeeding generation. Calvary Lutheran Men’s Club: 68 years old and still well, alive, and playing an active role in the ministry outreach to the congregation and community. Monthly meetings continue to involve a supper and studies in various areas of faith and life. The group seems to be able to eat well, make money and contribute to various facets of the church’s life. Along with the obvious, there is the drawing together of the men of the church in study, growth, and work. Installing sidewalks along educational unit of the church in 1965. Paneling and putting up ceiling tile in upstairs of the parsonage. Cemetery improvement including planting trees. Assisted in laying carpet in the new church. Supported Calvary Lutheran Vietnamese Fund. Contributed to Good Samaritan Fund. Work nights to paint trim of church and general yard work and clean up. Camp Minne-Wa-Kan cabin improvement (shingling and renovating). Sponsor our Boy Scout Troop No 82. On Sunday, November 8, 1970, Calvary Lutheran Library officially opened. Several members of the congregation visited the library and enjoyed coffee and cookies. Many books were checked out, most of them being taken out by children and young people. Almost all the books for that age group were checked out by noon. All books were lined up on metal shelves. In 1975, Lester Sullivan and Jack Armstrong built the first permanent shelves for the library. On May 2, 1978, 607 books were on the shelves. By April 12, 1983, 2023 books were on the shelves. The library includes an extensive tape section. It also has a very fine bookstore. The library was organized by Sylvia Jerdee and Lorraine Wubbels. Sylvia Jerdee also became our first librarian assisted by Lorraine Wubbels. Everyone loves puppets- and they are one of the most exciting methods for teaching, training and just good entertainment. How can lifeless pieces of foam and fabric capture the attention of people, regardless for age? In the hands of a skilled puppeteer, they assume life-like qualities. The puppeteer must be able to create his own personality or new ones, inside the foam body of his puppet. And that’s where the fun begins! The puppeteer must develop a special relationship that results in the puppet appearing to be a natural, expressive, loveable personality. And when this happens, puppets work. The spectator soon finds himself caught up in the performance and often identifies in some way with the puppet character. Several years ago, the Moen family was introduced to the Puppet Ministry by a young youth director and formed a puppet group in their former church in Bloomington, MN in 1981m they formed a group at Calvary called “The Calvaliers”. Now with nine teenage members, they perform in church for the children’s sermon, once a month for Sunday School, at Bible School, and occasionally at other churches and institutions. One of the highlights of the year is at Christmas time when they share the love of the Lord with the residents of the nursing homes and the day care centers for our “special friends”. The Altar Guild has many responsibilities within our church. One of our biggest accomplishments during 1981 and 1982 was our fund raisers and having the paraments made. The Altar Guild sponsored bake sales and the annual Fall Craft and Bake Sale during 1981 and 1982 to raise funds for the new paraments, which were dedicated in February of 1983. The new liturgical altar paraments were designed by Bemidji State University artist Marley Kaul and hand woven by his wife, Sandy. The colors and design concept used tor the wool paraments reflect the Northern Minnesota environment as well as the architecture of the worship center. The design focuses on the cross as the foremost symbol of Christian worship with flowing lines suggesting the presence and energy of the holy spirit within the congregation. The one evokes God’s creation and action in the lives of people. The other calls attention to response in worshipping the risen Christ. Marley and Sandy also designed and made coordinating stoles for both of our pastors. Their work is exceptional. Many of the Altar guild’s other duties are making baptismal napkins, setting up things for baptism and communion, taking care of the acolytes’ gowns, keeping the eternal light burning, keeping supplies on hand, changing the banners according to the event, and keeping the altar area dusted and candle holders polished. The Altar Guild is also responsible for seasonal duties such as ordering the palm branches and getting donations of Easter lilies for Easter, setting up for communion for the Passover meal, having the Advent Wreath decorated, putting up and decorating the Christmas tree, getting donations of poinsettia plants to decorate the altar area. The Altar Guild is also funding special banners which will beautify our worship area. Some banners are in the process of being made now by the Altar Guild ladies and other members of the CLCW. On August of 1978 Pastor and Mrs. Selmer Hilde hosted a group of Calvary seniors and friends in their home on Long Lake for an afternoon of fellowship. Those in attendance agreed that we should continue to meet together and decided that we would set the first Tuesday of each month for our meeting time and meet in the Library of the church. Mary Kluver was chosen as our first chairperson; Gretchen Sullivan, vice-chairperson; Mabel Ellis, secretary-treasurer; and Ina Hilde, program leader. These officers served for the following year also. Several members submitted names for our group and the “glowing Age Club” suggested by Pastor Hilde, was selected. It was decided that our meeting together would not be for the purpose of raising money, but that our emphasis would be on good spiritual fellowship and programs that would help to enrich and benefit the lives of our senior members. However, the generosity of those attending has enables us to do a little mission work through gifts of Bibles to Africa and China, used eyeglasses for foreign fields, quilts, monetary gifts to various causes including World Hunger, a Memorial Living Stone and Calvary kitchen supplies, and cards and notes to seniors of our Calvary family. Officers for 1980 included Ina Hilde, chairperson; Mary Kluver, vice-chairperson; Gretchen Sullivan, secretary-treasures and Julia Thompson and Mary Kluver, program leaders. In September of 1980 we began holding our meetings in the Community Room at Evergreen Acres Apartments. This was done to enable more senior members to attend the meetings and gave opportunity to other seniors in the building to attend. This proved to be a wise move as our attendance nearly tripled. In August we had the privilege of honoring Selmer and Ina Hilde on their Golden Wedding Anniversary at a potluck picnic at the home of Leroy and Julia Thompson. They were presented with a gold clock from the group. During the year 1981 officers were Mary Kluver and Gretchen Sullivan. A historian was added and Celia Olson consented to keep a picture record of our activities. The year 1982 continued in good fellowship under the leadership of Doris Manecke, Celia Olson, and Ina Hilde. Music has played a large part in our fellowship together. Hymn singing is a favorite and Darlene Stag has been our accompanist on the piano during the years. Several of our seniors, as well as young people, have added to our music enjoyment with instruments and voices. We enjoy special speakers, films and displays and have fine cooperation from our Pastors for spiritual guidance. The last several years at Calvary Lutheran have seen a great deal of change. The new building was begun in the summer of 1981. In the time before that, we realized some kind of expansion would be taking place so the women of Calvary began planning for the kitchen area. Bake sales and the annual smorgasbord took on new meaning as we realized the many expenses involved in equipping a new kitchen. Through all this we continued to make quilts, collect and sort clothing, assemble layettes for Lutheran World Relief, and designate money for world hunger, along with donations to church related and community organizations that help people in need. In 1982 we began to provide cleansing kits to the women in jail and expanded that to giving kits to Evergreen House and the Battered Women’s Shelter. In 1983 New Life Circle was formed and quickly gained many members. After moving into the new building in April 1982, the CLCW was called upon more often to serve at church and conference functions. To ease that burden on the monthly service groups, a catering committee was formed early in 1983. So far this has proven to be very successful and the committee is growing in number. The CLCW consists of 12 service groups-one for each month; 9 circles- Mercy, Grace, Pearce, Martha, Hope, Ruth, Joy, Faith, and New Life: Wedding Committee, Funeral Committee, Catering Committee, Visitation Committee, Altar Guild, Prayer Chain, Library, and Bookstore.